She used a State Department office closely involved with counterinsurgency efforts in Afghanistan and Iraq to aid the coup regime in Honduras. In 2012, as Honduras descended into social and political chaos in the wake of a US-sanctioned military coup, the civilian aid arm of Hillary Clinton’s State Department spent over $26 million on a propaganda program aimed at encouraging anti-violence “alliances” between Honduran community groups and local police and security forces. The program, called “Honduras Convive,” was designed by the US Agency for International Development (USAID) to reduce violent crimes in a country that had simultaneously become the murder capital of the world and a staging ground for one of the largest deployments of US Special Operations forces outside of the Middle East. It was part of a larger US program to support the conservative government of Pepe Lobo, who came to power in 2009 after the Honduran military ousted the elected president, José Manuel Zelaya, in a coup that was widely condemned in Central America. In reality, critics say, the program was an attempt by the State Department to scrub the image of a country where security forces have a record of domestic repression that continues to the present day. Honduras Convive (“Honduras Coexists”) was the brainchild of the Office of Transition Initiatives (OTI), a controversial unit of USAID that operates overseas much like the CIA did during the Cold War. Sanctioned by Congress in 1994, OTI intervenes under the direction of the State Department, the Pentagon, and other security agencies in places like Afghanistan, Haiti, and Colombia to boost support for local governments backed by the United States. Sometimes, as it has in Cuba and Venezuela, its programs are directed at stirring opposition to leftist regimes. Clinton gave the office a major boost after she became Secretary of State; its programs are overseen by an under secretary of state as well as the top administrator of USAID. The objective of Honduras Convive is spelled out on USAID’s website: “To disrupt the systems, perceptions and behaviors that support violence by building alliances between the communities and the state (especially the police and security forces).” A USAID official confirmed that the program is still ongoing, but played down US ties with Honduran security forces. Convive, he said, is “working in communities to build the capacity of civil society and government institutions, while strengthening community cohesion.” It was initiated “at the request of USAID and the broader U.S. Government due to high levels of violence in Honduras,” he added. “The beneficiaries of the Convive program are the Honduran people.” Much of the country’s violence is blamed on gangs and drug cartels and has led thousands of Hondurans to send their children north to flee the region. But contractor documents obtained about the program show that it was based in part on communications strategies to win “hearts and minds” developed during the counterinsurgency phase of the US wars in Iraq and Afghanistan. Several OTI officials and contractors overseeing the project came to Honduras from Afghanistan, where they managed the civilian, nation-building side of the war. They included Miguel Reabold, OTI’s country representative in Honduras, who previously represented OTI in Afghanistan. Part of the project was subcontracted to a company owned by counterinsurgency adviser David Kilcullen. In addition, a key part of the project was subcontracted to a company owned by David Kilcullen, who was the senior counterinsurgency adviser to Army General David Petraeus in both Iraq and Afghanistan. Kilcullen’s research methodology, according to a contract proposal I obtained, was “built around a streamlined set of metrics” that provide a “manageable method for assessing counterinsurgency campaigns that can be replicated and customized in other insecure environments.” The contract was submitted to Reabold on October 16, 2012. In a lengthy e-mail, the official added that Convive “has drawn its lessons from best practices in violence prevention, community policing, and community cohesion from urban environments all over the world.” Since the program began, he insisted, violence has declined. He provided figures showing “marked reductions in homicides between 2013 and 2014 in some of the city’s most dangerous communities,” with declines of between 18 and 46 percent in several municipalities. “USAID believes that homicides are decreasing due to a combination of factors, included among them a more cohesive community, represented by empowered leaders, working closely with Honduran government partners (including the police); international donors; and complementary USAID programs,” the official wrote in his e-mail. But nowhere in the USAID documents does the word “coup” appear. The agency’s claims and statistics stand in stark contrast to the situation in Honduras, where civil society has been reeling from a wave of political violence and assassinations perpetuated by what many believe are state-sponsored death squads. Even as Convive was being formulated in 2012, repression and violence had become a pressing issue for Hondurans. That January, UC-Santa Cruz historian Dana Frank described the carnage in The New York Times, reporting that “more than 300 people have been killed by state security forces since the coup, according to the leading human rights organization Cofadeh.” It appears to be just as bad in 2016. In particular, opponents of Clinton have seized on her own admissions in her autobiography, Hard Choices, that she used her power as Secretary of State to deflect criticism of the coup and shift US backing to the new government. “We strategized on a plan to restore order in Honduras and ensure that free and fair elections could be held quickly and legitimately, which would render the question of Zelaya moot,” Clinton wrote. The Clinton campaign did not respond to e-mails seeking comment on her department’s role in Honduras Convive or in shaping US policy toward Honduras. But in March, after Cáceres’s statements on Clinton were reported in The Nation, a campaign official told Latino USA that charges that the former Secretary of State supported the 2009 coup were “simply nonsense.” “Hillary Clinton engaged in active diplomacy that resolved a constitutional crisis and paved the way for legitimate democratic elections,” she said. The players in Honduras Convive provide a glimpse into the privatized world of covert operations managed by USAID and OTI, and how they dovetail with broader US foreign-policy goals of supporting governments friendly to US economic and strategic interests. They also show how Hillary Clinton might manage US foreign policy as president. Under Clinton’s 2010 Quadrennial Diplomacy and Development Review, OTI’s programs were expanded and strengthened, and the State Department pledged to “work much more closely” with the office. “We will build upon OTI’s business model of executing programming tailored to facilitate transition and promote stability in select crisis countries,” the review said. The overall plan for OTI was overseen by a Clinton deputy and the administrator of USAID. Most of its projects are contracted to a group of private aid companies in Washington. Honduras Convive, for example, was outsourced to Creative Associates International (CAI), a company that has worked closely with USAID’s OTI on projects in Afghanistan, Yemen, and Libya. In 2010, CAI teamed up with OTI to run a clandestine operation in Cuba dubbed “Cuban Twitter,” as revealed in 2014 by the Associated Press. It was designed to use social media to spark anti-government unrest in that country. A key piece of CAI’s project in Honduras, determining the social networks responsible for violence in the country’s largest city, was subcontracted to Caerus, Kilcullen’s company. It was founded in 2010 while Kilcullen was working as a top counterinsurgency adviser to US and NATO forces in Afghanistan. In addition to advising Petraeus, Kilcullen served during the Bush administration as a senior adviser on counterinsurgency to former Secretary of State Condoleezza Rice. One of Kilcullen’s first contracts in Afghanistan, according to the Caerus documents I obtained, was to design and manage a $15 million USAID program measuring stability in Afghanistan—a key task of the counterinsurgency effort. Kilcullen also developed close ties to the Office of Transition Initiatives. OTI is “the closest thing we have now to an organizational structure specifically designed to deal with the environments of the last ten to twenty years,” Kilcullen said in a talk to the New America Foundation in 2013. Like Kilcullen himself, the Caerus contractors who led the Honduras project had extensive experience with the wars in Afghanistan. Stacia George, Caerus’s “Team Leader” on the Honduras project, was employed at Caerus from 2012 to 2014, where one of her tasks was training “Department of Defense professionals on using development as a counterinsurgency tool in Afghanistan” (she is now deputy director of OTI). Another Caerus associate involved in the Honduras program, William Upshur, taught counterinsurgency tactics in Afghanistan for the Army’s 10th Mountain and 82nd Airborne divisions from 2010 to 2013 (he’s now an associate with intelligence contractor Booz Allen Hamilton). The Caerus proposal to OTI, which I obtained, emphasizes the company’s extensive experience with counterinsurgency, surveillance, and data collection in Afghanistan as well as its ties to OTI. Many Caerus staffers “have worked directly for [OTI] developing policy, implementing field programs, and managing program evaluations based on stabilization goals and objectives,” it says. The AID/OTI program was part of a grand US plan to improve security in Central America by building closer ties with local military forces and using US troops to train their police. 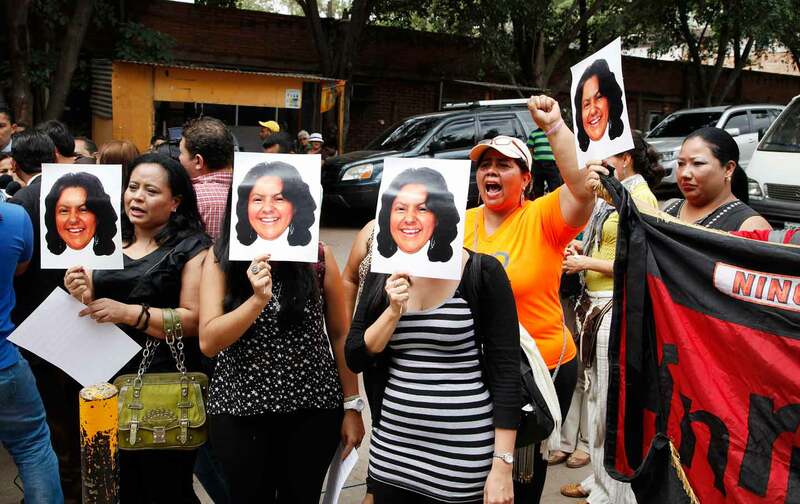 Honduras has become a litmus test for the plan. Today, hundreds of US Special Forces and Navy SEALs are training Honduran units for civilian law enforcement. The plan is “driven by the hope that beefing up police operations will stabilize a small country closer to home,” The Wall Street Journal reported. The training is set to expand in the $1 billion “Alliance for Prosperity” program for the region that was unveiled in late January of 2015 by Vice President Joe Biden. Main, the CEPR analyst, says Central Americans should greet the Biden plan with skepticism. “From the U.S.-backed dirty wars of the 1980s to the broken promises of economic development under the Central American Free Trade Agreement, the historical record shows that U.S. policies and assistance have often undermined prosperity, stability, and democracy in the region,” he wrote last year in NACLA Report on the Americas. In Honduras, Main told me, the overriding US interest has been “keeping this government in power.” The “window dressing” of Honduras Convive, he added, has “been going on pretty much since the coup.” Many observers, including lawmakers, agree. On March 16, 730 scholars organized by the Council on Hemispheric Affairs signed a letter urging the State Department to demand human rights accountability in its dealings with Honduras. “We are deeply concerned that the U.S. government condones and supports the current Honduran government by sending financial and technical support to strengthen the Honduran military and police, institutions that have been responsible for human rights violations since the coup d’état of 2009,” the letter stated.